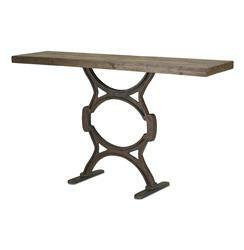 Crafted from reclaimed wood and a seriously strong cast iron base, this is an instant classic of industrial style. Each table is one of a kind and inconsistencies in color, grains, evenness are inherent qualities of reclaimed wood. Clean with a dry cloth and wax periodically.